When I traveled from Ecuador to the United States last week, my journey home was relatively quick and painless, a privilege of my status as a wealthy U.S. citizen. I boarded a plane in Quito, flashed my passport to customs officials in Miami, and touched down in Boston just before sunset — less than 9 hours after leaving Quito. The most challenging part of my trip was re-checking my luggage at Miami International Airport. After clearing customs, I hauled my two bags (one containing a delicate Ecuadorian end table padded with my dirty laundry) nearly a mile through a maze of lifeless, gray corridors. At the end of the tunnel, I was greeted with a long security line, which led to yet another snaking security line. Eventually, my bags were sent on to Boston; the table still in one piece. For Ecuadorians who want to visit, study or work in the United States, entering this country is far more difficult than enduring airport security lines. Visas are necessary and they are hard to come by, especially for the poor. Those who cannot obtain a visa often try to enter the United States illegally. Many emigrants leave Ecuador on overcrowded fishing vessels bound for Guatemala and Mexico. They are crammed in unventilated fish holds below the ship’s decks, where they may go for days without food and water. Some people die and others are seized by the U.S. Coast Guard. Those who survive the voyage often owe thousands of dollars to coyotes, or guides, who smuggle them through Mexico and into the United States. An economic crisis during the late 1990s sent many Ecuadorians searching for work outside South America. More than 600,000 Ecuadorians emigrated to the United States and Europe between 2000 and 2001, according to the U.S. Department of State. In recent years, high unemployment rates have continued to push job-seeking Ecuadorians into the United States. Today, an estimated one to two million Ecuadorians live here, according to the state department. The government of Ecuador has partnered with child advocacy groups to launch a public awareness campaign that warns people, especially children, about the risks of illegal immigration. While walking through Quito’s Parque Carolina on my way home from Spanish class, I would pass the billboard pictured above. 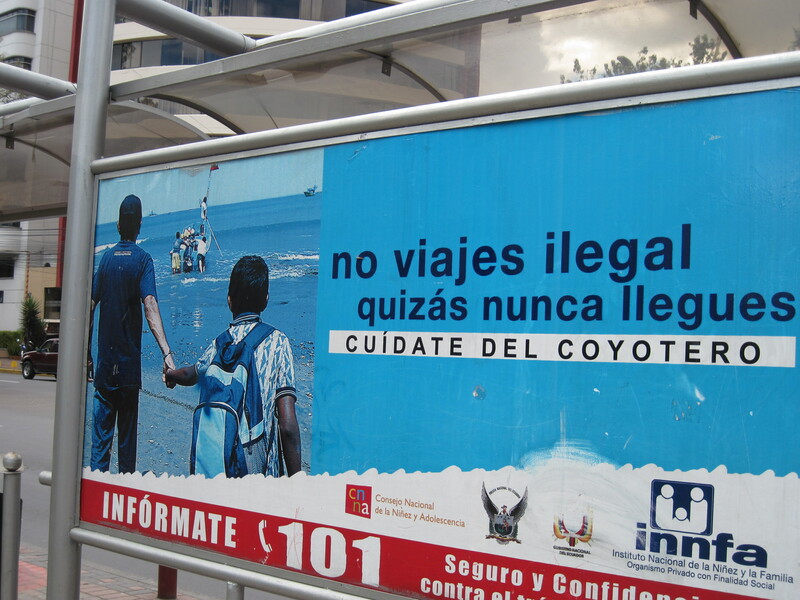 Translated into English, it reads: “Don’t travel illegally. You may never arrive. Be careful of coyotes.” I found the billboard haunting, especially knowing the ease of my return trip to the United States. Though I am now back in Boston, I plan to publish more ThreeBeats stories about Ecuador in the coming weeks. Below, I have posted a few more photos from my stay in Quito. I have also posted the first submission to the ThreeBeats Challenge (see sidebar). This YouTube video features surfer-activist Kyle Thiermann and his take on a proposed coal power plant, which he claims will threaten the fishing industry and pollute the marine environment of Constitucion, Chile. The video link was submitted by ThreeBeats subscriber Emily Thompson of New York City. Good post. My host sister is visiting from Barcelona with her three-month-old son. I believe she has dual citizenship (Spain and Ecuador). She traveled through Miami to get here. In Miami she was strip-searched and all of the gifts she brought for the family (olive oil, wine . . . etc.) were thrown away. Becky, thanks for this vivid account. We’re soon to go to press with an immigration-themed issue of Represent http://www.youthcomm.org, which will feature a story from a child’s perspective detailing the trauma of such crossings (the issue goes to press in late March). I recently attended a screening of a 2006 documentary, “La Americana,” which follows a young woman’s journey from Bolivia to New York. We may review it in Represent. The film does a good job of showing the family and personal sacrifices people make to cross illegally — along with the economic circumstances that drive them to such lengths. Difficult for most Americans to appreciate. Thanks for your thoughtful comments, Autumn. I look forward to reading the immigration-themed issue of Represent, especially the personal account of the child’s crossing. Has “La Americana” made it to Netflix?